A romantic 17th century re-creation of a castle, built by Sir Charles Cavendish, on the site of a much older Norman fortification. Its fairytale corner turrets, pinnacles and battlements rise above a high wooded ridge, with splendid views over the Derwent Valley. Marvelous gardens with outstanding statuary and fountains. A classical mansion built between 1687 and 1707 by William Talman for the 1st Duke of Devonshire. Mary Queen of Scots was once a prisoner here and also at Wingfield Manor. Her jailor was George Talbot, Earl of Shrewsbury, who also arranged her execution. Travel on a restored tram and take a trip back in time at the award winning National Tramway Museum. Recreated traditional village street with exhibitions, shops and a tea room. Entrance price includes unlimited tram rides. A fantastic family day out. With a children's play area, woodland walks and sculpture trail. 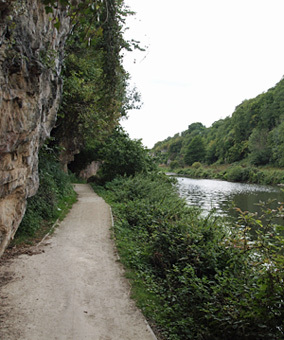 Cromford Moor and the High Peak Trail (high above the village of Cromford), is a good place for recreation and walking and a popular place for climbers. 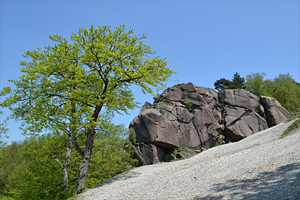 Black rock (shown right) is an outcrop of grit-stone sculpted by the elements, which resides in this area. 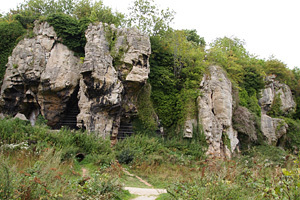 Prehistoric caves set in a limestone gorge, surrounding a small lake. Ancient tools and artifact discovered within the honeycomb of caves provide evidence of life during the last Ice Age (approx. 50,000 to 10,000 years ago). A museum and heritage centre at the entrance tells the full story. Cave tours run at weekends and during local school holidays. Please book in advance by phone - charges apply. 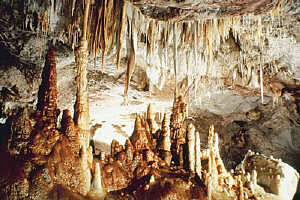 The porous limestone hills of Derbyshire are laced with show caverns, the most popular of which include: Speedwell Cavern, Peak Cavern, Treak Cliff Cavern (shown right) and the Blue John Caves. Stretching some 15 miles down river from Matlock Bath to Derby, the Derwent Valley Mills World Heritage Site provides an interesting group of historic Mill complexes, including some of the world's first modern factories. 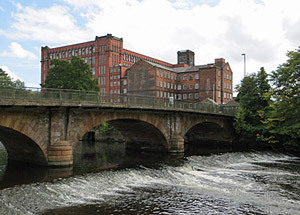 At the heart of the site is the town of Belper, which has one of the oldest surviving Mills in the area - Strutts North Mill. This 55 mile (88 km) route (opened in 2003) follows the course of the River Derwent as it flows from the Ladybower Reservoir near Bamford, to the point where it merges with the River Trent near Sharlow. Despite its short length, the Derwent flows through a variety of varied and changing landscapes combining with naturally verdant meadows, gritstone edged valleys and a wide variety of man made features from stepping stone river crossings to the mighty mills from which the heart of the industrial revolution flourished. 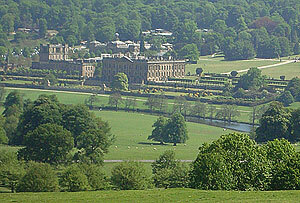 The Derwent Way passes through several important towns and villages, including Matlock, Belper and Derby and also the grounds of Chatsworth House. Pottery has been made here for over 200 years. Tours of the working factory illustrate how this famous pottery is still made. A picturesque moorland country, cut by gorges or dales, of which, Dove Dale is considered to be the most beautiful. 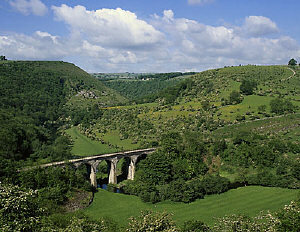 Monsal Viaduct, located in the breathtaking Monsal Dale (shown right) is one of the most photographed sights in Derbyshire. Travel back in time to the age of steam and diesel and enjoy over nine miles of this scenic heritage railway, which runs between Wirksworth and Duffield. Regular diesel services and some steam services at weekends. 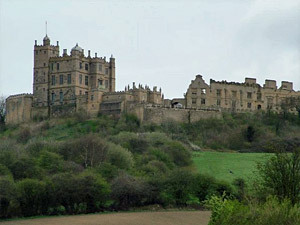 Built by William de Peveril the natural son of William the Conqueror. The present building was completely and faithfully restored in the 20th century. Family home of the Curzon family for over 800 years. The present mansion, built in the 18th century, was Robert Adam's first great work. 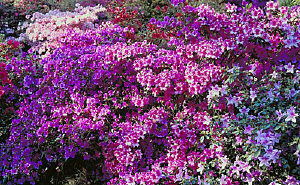 One of Britain's finest ericaceous plant collections, with glorious shows of Rhododendrons, Azalea and Camellias from all around the world. Colourful rock and alpine gardens. Spectacular views across the Derwent Valley and pleasant woodland walks. A country mansion developed between 1563 and 1644 by Sir John Coke, further developed by his great grandson, the Vice Chamberlain to Queen Anne and George 1st. Collection of antique railway locomotives and rolling stock. Regular heritage train services across seven miles of beautiful derbyshire countryside. 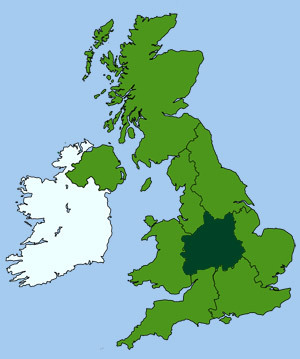 An expanse of moors and forests between Sheffield and Manchester, that spread across most of Derbyshire. Known locally as the 'Roof of England', it contains some of the wildest and most beautiful country in England. The area became the nations first National Park in 1951. It has two distinct geological landscapes. 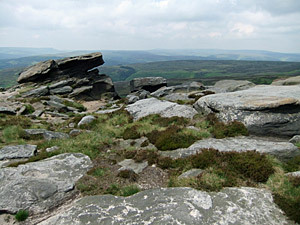 The wild moorlands to the north that form the Dark Peak with rocky features creating a rugged skyline. And the limestone slopes of the White Peak in the south, which provide a more gentler landscape. The area's wooded dales, craggy hills, picturesque villages and unspoilt landscape contain a network of walking trails that draw over ten million visitors each year. Located just north of Matlock. Contains the country's largest collection of horse drawn carriages, including stagecoaches and Royal Mail coaches. An Victorian Cottage in the old mining village of Riddings where local handmade pottery and other textiles are produced. Locally sourced clay is processed and refined, then formed on a traditional potters wheel and fired in the local kilns. Residential courses available.